Tartan is probably the most widely recognized, and most famous material anywhere in the world today. So how did it get to be so famous? Simple, its use in the manufacture of the world's most famous National Dress, namely the Scottish kilt. The origins of the cloth are thought to go as far back as 800 BC. Textile analysis of fabric recovered from graves in Western China show similarities to Celtic patterns from Northwest Europe. The oldest piece of fabric to be found in Scotland dates from the 3rd century, and is known as the "Falkirk sett". It is almost identical to the Northumbrian sett which was previously believed to be the earliest in Britain, and consists of a checked pattern of two colours, which have been identified as the undyed brown and white wool of the native Soay sheep. So although Scotland can't claim to have invented the cloth, it can certainly claim to have made it famous. Prior to the Victorian era, which romanticized all things Scottish, tartans were more likely to be associated with different regions or districts. Nowadays the association is with clans, and nowadays many of the clans can claim more than one. But you don't have to be a clan member, in order to wear a Scottish tartan. Although many traditionalists would give me an argument on this matter, the fact is there are no rules governing what you can or can't wear. And for those of you who would rather not wear a clan kilt for whatever reason, there are so many different tartans to choose from that you are certain to find one you like. Some people refer to it as the kilt pattern although strictly speaking it should be referred to as a sett. 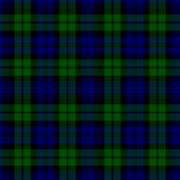 There are also many generic tartans, the most famous of these being the Black Watch, which you can see pictured below. The Scottish Regiments played a major role in bringing kilts to the attention of the world, as they were deployed in many battles from the mid 18th century to the present day. And although kilts are no longer worn on the field of battle, they are still an integral part of the dress uniform of Scottish soldiers. Arguably the most famous sett is the Royal Stewart which is worn by units associated with the Royal Family, it also happens to be the most popular choice when renting a kilt in Scotland. it has been used in the fashion industry for many years, and of course you can also find it being used for scarves, ties, waistcoats and many many Scottish souvenirs. Designers are now also making tartan wedding dresses which are guaranteed to turn heads. So whether or not you have family connections to a particular sett, rest assured there is enough variety to choose from, to guarantee finding at least one you like.